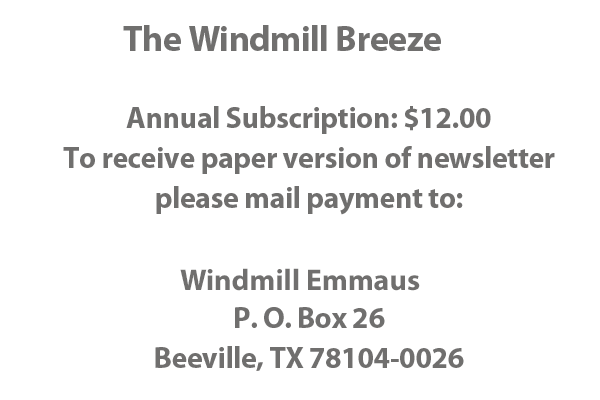 Welcome The Windmill Emmaus 4th Day Group elected its first Board of Directors in 1992 and has blossomed ever since. We are located in the Brush Country of South Texas, encompassing most of Bee, Karnes, Jim Wells and Live Oak counties. In the past twenty five years, many have attended Southwest Conference Emmaus Walks at Zephyr Baptist Encampment, sponsored by the Windmill 4th Day Group, with our Lord and Savior, Jesus Christ. 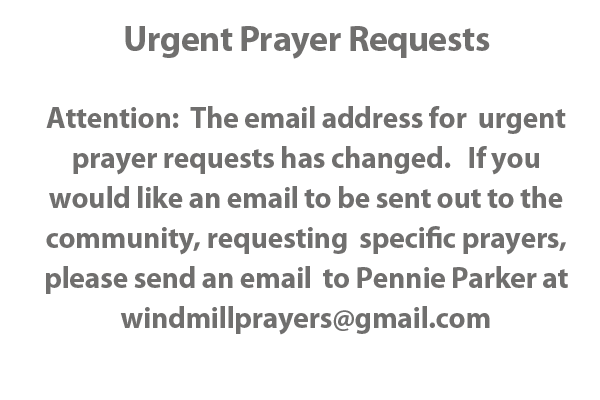 If you are interested in attending a Walk to Emmaus weekend sponsored by the Windmill Emmaus 4th Day Group, please send an e-mail to Windmill Emmaus at prayers@gmail.com. Beth Bible of San Antonio announced at our SWTC board meeting that she has completed all of the materials used during a Walk in Braille. This includes purple book, song book, team and lay director manuals. So, if you have someone who is visually impaired and is interested in attending a Walk to Emmaus, please don't hesitate. Get in touch with me and I will get the information you will need to get these materials. We know this is such an act of agape love for those who are visually impaired and I give thanks for Beth for taking the time to complete this task.